Last year the city’s Landmarks Preservation Board designated the house a Seattle landmark. It is also on state and national registries. Craig McNary, moving here from New York City, was very excited to buy his first home. It took him a little while to do that, though. He got outbid four times. But then he didn’t. 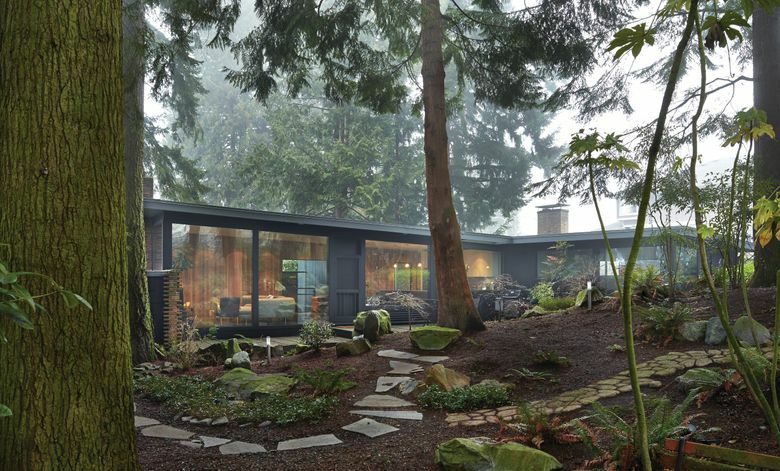 And he scored this, an architecturally significant Midcentury modern in North Seattle that came with a whole lot more than just a place to park the sofa. McNary got himself a real education in history, architecture, horticulture and city code. And, after a time, his wife. 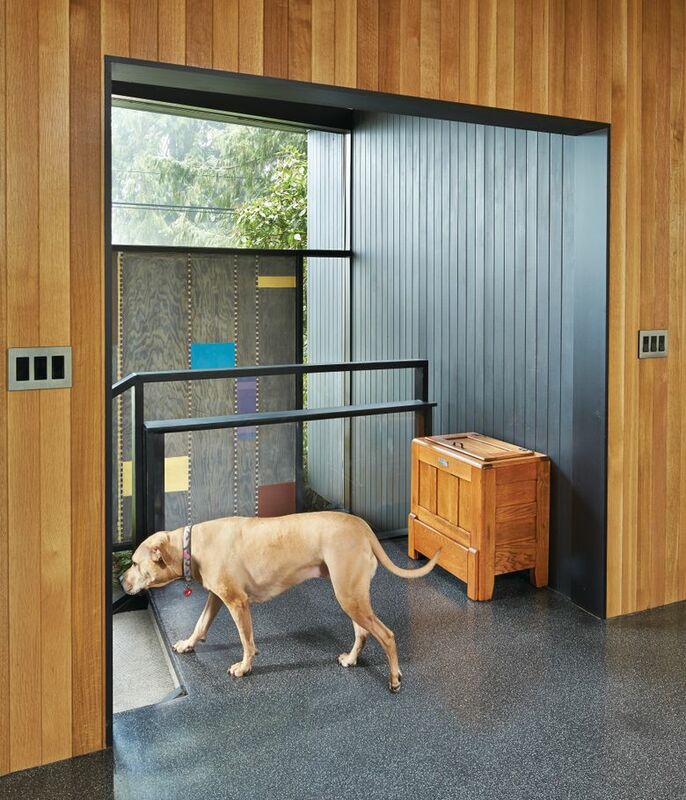 See this home and others on the Seattle Modern Home Tour, 11 a.m. to 5 p.m., Saturday, May 2. Tickets are $30 in advance, $40 the day of tour (available at any house on the tour). Kids under 12 may accompany an adult for free. 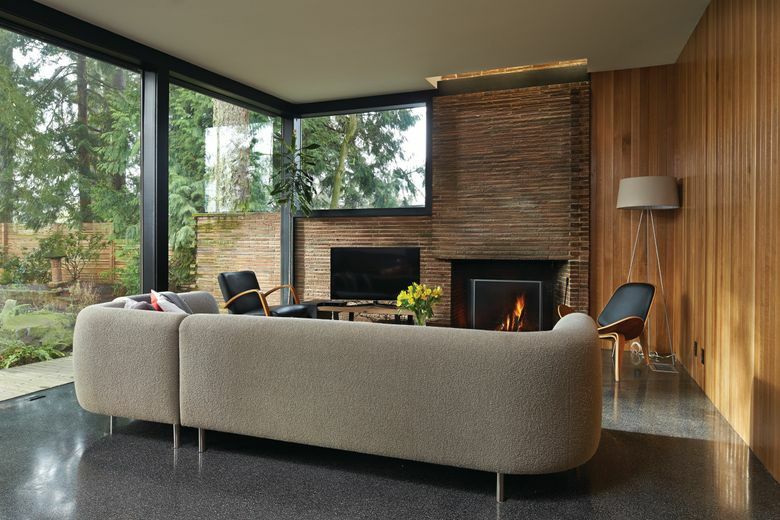 Readers of Pacific NW magazine can get $5 off the price of each advance ticket purchased online using the code PNWMAG at modernhometours.com. 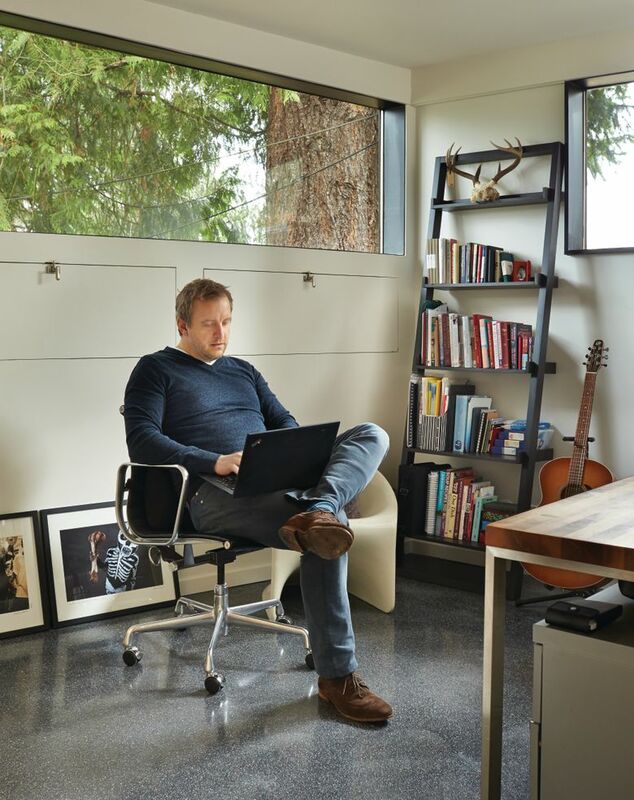 “This is exactly the house I imagined I would find,” says McNary, an advertising executive for Microsoft’s global marketing team. He still is amazed and delighted. 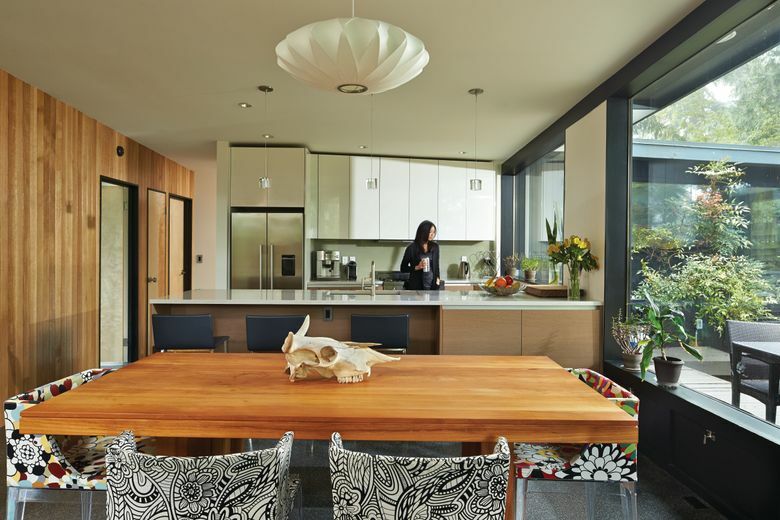 And currently seated at the dining table of his open and woodsy home, a place so cool and so special that last year the city’s Landmarks Preservation Board designated it — 1,700 square feet with three bedrooms, 2.5 baths — a Seattle landmark. (It is also on state and national registries.) Seated across the table is his wife, Adeline Ee, their dog, Lola, at their feet. Great houses have a vibe. Architect James Chiarelli designed this one for his family. The L-shaped single-story house with a shed roof and concrete-block foundation is sited for privacy. The main level is cantilevered, making the structure appear to float. 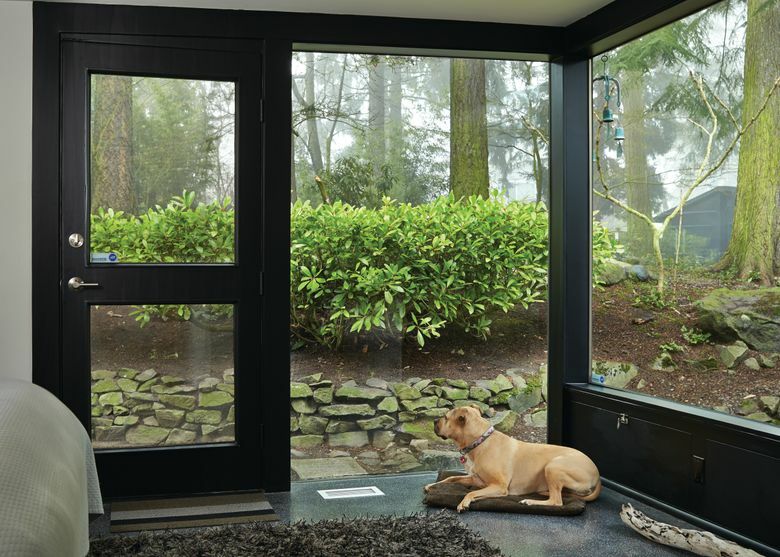 Large window walls face the forested backyard. Floors are terrazzo flecked with abalone. The master bedroom is surrounded by glass and nature. The architect, his wife (Pat) and brothers began construction in 1948 and worked on it for more than two years. (During the time that he and Paul Hayden Kirk partnered as Chiarelli & Kirk.) If you’ve been to the Burke Museum of Natural History and Culture, you’ve been in a Chiarelli. “She was pregnant and pounding nails. His drawings were on butcher paper that he made over the weekends,” McNary says. The Chiarelli’s newest owner got this bit of news straight from the source, Pat Chiarelli, now a widow. The couple, married last fall, invited her over to see their work, updates respectful and compliant for landmark status. “When I bought the house (2012) it needed some work,” McNary says. “I thought, I’ll spend $20,000 and update the electrical.” That meant opening walls. Opening walls revealed decay and mold. McNary called architect Leah Martin of Allied8 and interior designer Anne Viggiano for help. After much angst, partitions in the main living space fell for a larger, open kitchen. (“I told them to take out the partitions and then changed my mind,” says McNary, his own general contractor. “I was going over to tell them, ‘Don’t do it!’ But they had already started.”) There is new paneling in the main living space, rift-cut white oak. The ceiling holds new can lights and R7 insulation. 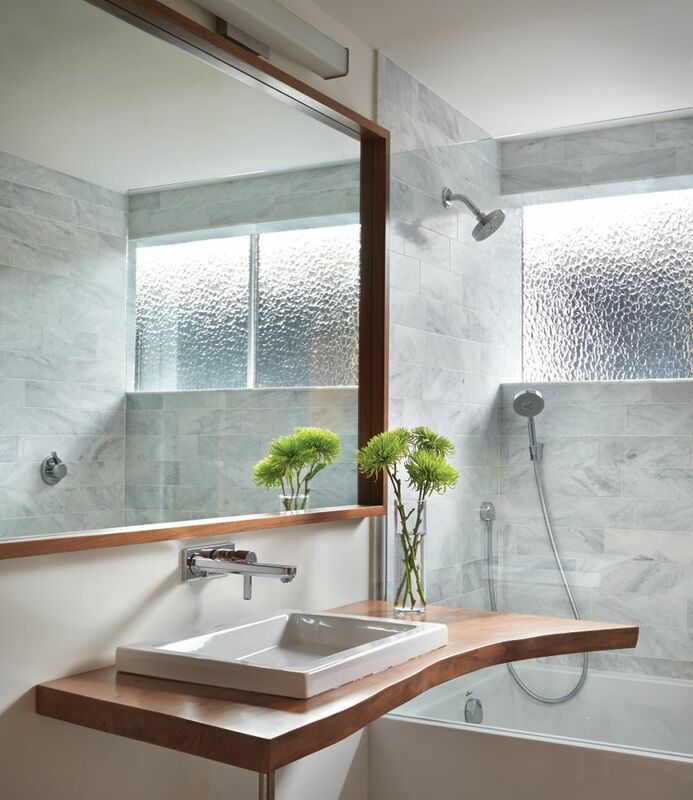 The master bedroom is now a true suite, the old bathroom (and closet space) redrafted into two baths. 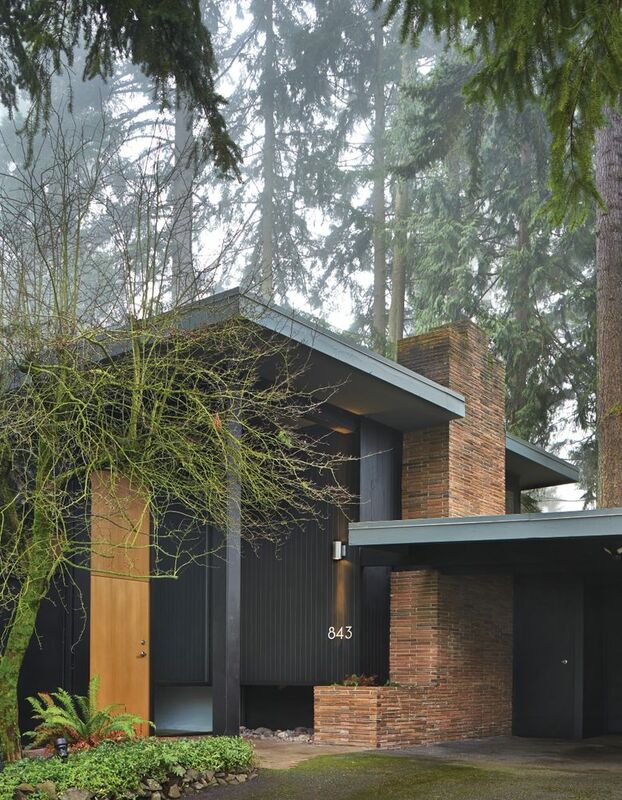 The home was up for landmark status throughout the remodel. It was always McNary’s goal.